Detailing the physical features, habits, territorial reach and other identifying qualities of the Net-Winged Beetle. 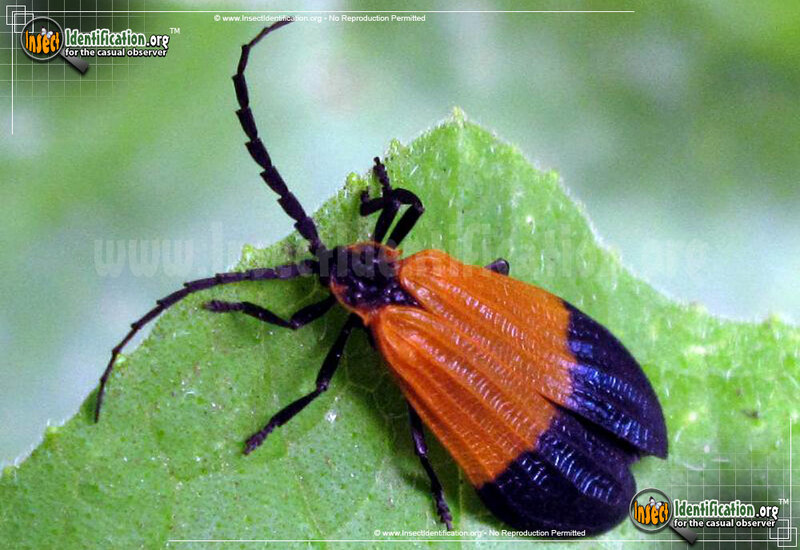 The orange and black Net-Winged Beetle has fine texture on its soft wing covers, something not seen on many beetles. This beetle resembles a firefly, like its close cousin C. reticulatum, but the ridges and net-like pattern of veins on this species' wings place them in the Lycidae family. They do not glow. The elytra (wing coverings) are mostly orange with a thick black band covering the lower part. Many similar sized orange and black insects taste bad, so this coloring is a passive defense in itself, but when threatened, adults open and lift their wings as a defensive warning, perhaps making themselves appear larger and more aggressive. This Net-winged Beetle does not have a stinger, and does not fight, so this display may not always be effective in scaring off a predator. Larvae hunt for small invertebrates and perhaps even fungi in leaf litter or decaying wood on the forest floor. Adults are usually seen at sundown either resting on flowers and other vegetation, or in the air, moving between stops. They are slow in flight.